Today I feasted on passion. 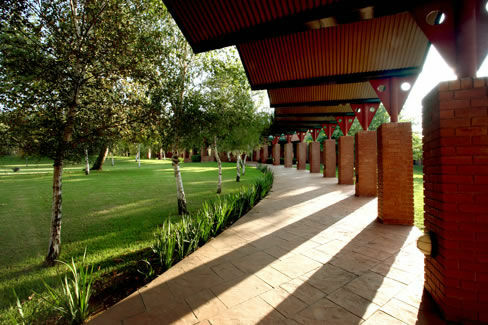 The scrumptious meal: my visit to the Africa Leadership Academy (ALA). Rarely have I had the opportunity to visit a place that genuinely encapsulates a dream, captures the imagination and makes what seems unattainable doable. Hazem, an ALA student and one of the Academy’s ambassadors, was my tour guide. It was as though the very structure of the school, the walls, the floors, the windows – the students, the staff – were held together by the dream to build an Africa that, at this point, seems almost impossible to imagine. Hazem told me how the school operated – what his own experiences were – what he saw lay ahead for him as a result of being a part of ALA… it was hard to not be emotional. After the tour I sat down with ALA’s founder and president Fred Swaniker. We spoke of what had inspired his vision for the school and how he built it. Creating something amazing is no easy task. But as I walked around the Academy I kept reminding myself that each brick that made up ALA, each book carefully shelved in the library, every coat of paint – was once merely a thought – a hope – a dream. Fred took that dream and built something we can all see – now. Less than five years ago it was all in his head. I urge you to take the fabric that is your dream and weave it into something tangible that we can see. We need you to do this. Just like Africa (and the world) needs people like Fred – we need you. Even the greatest of dreams start out small – but they can never be if we don’t have the courage to start. I hope to share the story of ALA with as many people as I can because for me it transcends beyond what it’s achieving – the Academy shouts to the world what is possible when we dare. My visit to this Academy reminded me how much impact one person can effect when they step out. We need you to step out. Please share the story of ALA – Tweet it – share it on Facebook – email it to your network of friends – post it on LinkedIn – wherever there are eyes and ears – I hope you’ll share. 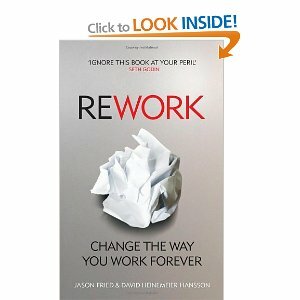 I’ve just finished reading ReWork. I cannot shout out enough how AWESOME this book is! It debunked a lot of myths; Challenged how I’ve been doing things and showed me not only better but FANTASTIC. Below is a snippet of the book. I hope you’ll read it. If you want to do something, you’ve got to do it now. You can’t put it on a shelf and wait two months to get around to it. You can’t just say you’ll do it later. Later you won’t be pumped up about it anymore. If you’re inspired on a Friday, swear off the weekend and dive into the project. When you’re high on inspiration, you can get two weeks of work done in twenty-four hours. Inspiration is a time machine that way. Inspiration is a magical thing, a productivity multiplier, a motivator. But it won’t wait for you. Inspiration is a now thing. If it grabs you, grab right back and put it to work. 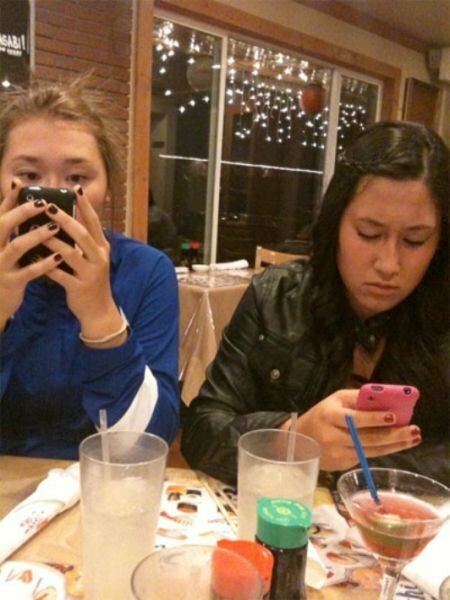 Boy did I look like an utter idiot when I took my cousin out for lunch the other day. He texted throughout our outing – the restaurant was busy and there I was looking around – eavesdropping on other people’s conversations – then looking at my soda glass as though I could see my whole life mapped out on it – then when the food came examining each morsel before I ate it – all in the hope of looking “busy” because my lunch date was far too engrossed in his cell phone to talk to me. So when I was emailed the following pics just a few days later – I knew we were in real trouble. So Saturday we hosted our Triple V Breakfast: RELOADED. One of our guest speakers, Denis Fourie, Founder and CEO of the Trusted Advisor, spoke to us about the power and worth of networking (among the many things he shared with us). And I realised that from the way I’ve seen a lot of us do it we may be going about it the wrong way. Denis asked how many of us had physically met with the people on our networks: be it on Facebook Twitter, LinkedIn or other online networks. He then told us that he currently had about 16 000 people on his network. Over the past thirteen years he had physically met 12 000 of those connections! I can honestly tell you I haven’t met, even, a fraction of the people on my social media networks. And here’s the bottom line – your network can say you have a gazillion people – but how many of them are real, mutually beneficial, relationships? Quality networking is about building real relationships. Here’s a real example: The speakers I rope in at our business events are highly successful entrepreneurs – at this stage our business cannot afford to pay these speakers what our massive competitors can. For instance in November Denis will be speaking at the Africa-Asia-Europe Trade and Investment Summit to be held in Cape Town. I managed to secure a speaker like Denis simply because of my bid (and his) to build meaningful relationships. So far this is what I’ve had to rely on as we build our incredible business events. The speakers come because they know my heart and my desire to see fellow entrepreneurs grow – and I’m finding that for the most part successful people are so generous in sharing what they know – and because we can connect on that level they give me the time of day. That’s just one example of the power of building real relationships. 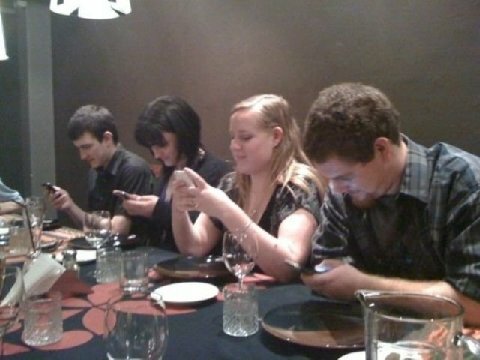 So how are you building your network? Are you accepting every “friend” or “follower” request to boost your ego or to enjoy swelling numbers that really mean nothing at the end of the day? Or are you doing what a successful entrepreneur like Denis does and value each potential “friend” or “follower” as a human being and not just a number? Looking at how Denis has and continues to build his empire – methinks his strategy works better. I have found that a mother-daughter relationship can sometimes be one of the hardest, most emotionally tugging, relationships to have – and yet it is one that moulds women for better or for worse. My mom turned __ this week. I don’t think she’d mind me saying her age because she’s extremely open about it. Also she looks AMAZING… But the age is not the point – her life is. …and she’s proud to be a gran! My mom comes from a place where women weren’t treated with high regard. Her own mother was one of many wives – my mom was but one child in a sea of my granddad’s children. And yet in all that I consider her to be a woman of substance. It’s not easy to fight for better in life when for the most important, foundational stages, of your existence you were showed that you, as a girl child, and as a woman were not valued. My mom comes from an experience where men could take wives as one would a loaf of bread. And just like bread, women in the eyes of their husbands, could go stale – and another “loaf” could be ordered. This was not only accepted but the norm. For the most part the women I remember from where my mom came from were industrious and yet there seemed to be this invisible barrier they could not overcome. I don’t think they even tried to break that barrier – it was almost as though they accepted the lie that they were nothing without their husbands. Those that did fight, perhaps like my gran for instance, did so by pushing for their kids to not live the same lives. From where my mom comes from women were beaten for not “behaving” as their husbands ordered. Whatever their husbands’ wrongs, be it drunkenness or other women, slackness or violence, the women had to “accept” their men as they were, be silent and take it. Protest was deemed insolent and punishment swiftly followed. This experience and background is not only my mother’s but mine too. And yet I am a woman of substance. That has a lot to do with what my mom taught me. On the one hand she taught me to take care of my home with finesse that can only come from a woman’s heart; She taught me how to pamper my husband and make him feel like a king; She taught me to care for people and never to treat others based on what they had or their status but as humans beings with a common need to be seen, acknowledged and heard. So while I’m perfectly “domesticated” don’t let that fool you. I’m just as savvy and ambitious when it comes to business. My mom taught me to be a fighter and to be industrious. She taught me that being soft and domesticated did not mean I was weak. Life for my mom was tough. As a woman she had to fight to be seen and heard in an environment that didn’t want to hear her voice nor valued her opinion. And yet she fought to find her voice and taught me that my opinion mattered and my voice was worth hearing. I carry that with me in my personal life and in my work. 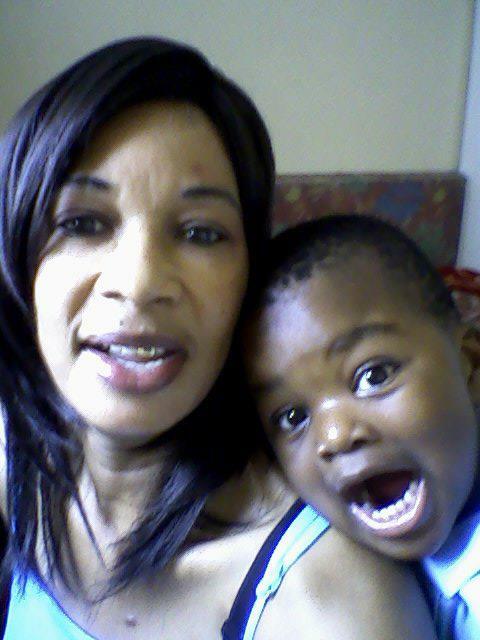 My mom taught me that being a woman is such an honour from an all-wise God- An honour not to be taken lightly. Despite her own struggles (and I believe sometimes a battle so see her own tremendous value) – my mom taught me that I was worth the earth, the sun and the moon. As a child the bulk of my relationship with my mom was that of coach and student. And yet even in that she showed me that I was worth so much and I dared not settle for anything less. It is this utter conviction in my worth that compelled me to shut the door on boys and later men I so adored and yet would not compromise for. My husband is quite something. I didn’t settle Mommy. At school I was considered an average student. I never received an award for anything and yet my mom told me: “Oh they don’t know Hannah. They don’t know who you are. You are an amazing child!” And then she took it upon herself to shower me with her own rewards instead. It was this utter confidence in how remarkable I was that even when doors were slammed in my face – be it in matters of the heart – or in my career or business – somehow I would remember that I was worth something. And not just “some thing” but the earth, the sun and the moon – and I dared not give up but rather reached for higher because I knew I deserved it. Generally women lose their sense of self and sometimes even worth when they love a man. But my mom’s reminder of my worth as I was getting into the biggest commitment of my life reminded me that I owed it to me to never abandon me. I owed it to me to not eat BS like so many women before me had done. It’s not arrogance. It’s what we’re entitled. Women lose their sensibility when in love. Sometimes more so than men I think. It’s too late to speak sense to us when we’re in love. Far too late. Speak sense to us WAY before we fall in. My mom did that for me. I’ve been married a mere six years. You learn very quickly that it can be the most amazing relationship or the worst. There are times I’ve had to fight for me in my marriage. Sometimes I’ve had to stick to my guns and demand to be heard and seen not because I’m arrogant or insolent but because I know I’m worth being seeing and heard. I’ve no desire to be my husband’s equal. He remains the head of our home and the priest of our household. God gave him that position and I dare not argue. It’s a wise woman who finds joy in this set-up. It’s a wise man whose wife thrives in this set-up. My mom and I fight often. We often disagree. 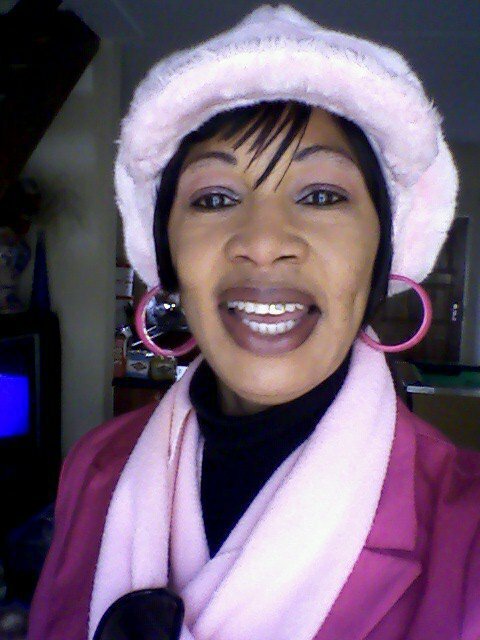 And yet this week as she celebrates yet another year of her life – I cannot but praise the investments she’s made in me. Growing up I feared my mom. She truly did rule with an iron fist. As an adult now, and a mother myself, I can honestly say looking back I may not always agree with some of her methods – but what I totally agree with was her utter commitment to parent us. My mom was never concerned with being popular with my brothers and I. She didn’t care how others raised their kids – like her own mother had raised her – my mom raised us to be prepared for life. Life can be a battlefield sometimes and I’ve learned that it’s dangerous to raise children to expect life to be a fairytale. For the most part I feel we live in a world where parents are terrified to parent. And in the end it’s the children who suffer. Often I see parents who seek popularity with their kids rather than do what is right. Way too many times I’ve seen parents cripple their children by doing too much for them, shielding them from life, and eventually those children, as adults, fail to stand on their own feet. My mom taught us boundaries and she taught us hard work. I am grateful for both. And the many other lessons I can’t fully list here. It’s easier to be successful when you’re born with a silver spoon in your mouth. And I don’t just mean money. My mom’s start was tough. Her own mom had her at fourteen. It’s tough to parent when you truly are a child yourself. Looking back at how my mom was born and how she grew – I feel she was born with clay not silver. And yet she took that clay and somehow despite what seemed like constant storms in her life she found it in her to invest strength in me. A silver spoon is a silver spoon. But clay – clay is ready for moulding from the onset. You can turn it into anything your mind envisions and commits to. The value is not in the silver or the clay – the worth of them both lies in the hands that hold them. My mom (even though she may not know it) taught me that. Hannah Viviers is the author of mommy24.com. She’s also founder of Hannah Viviers Business Training. I chose “ode” cos I like the sound of it – but this is not really an ode in the strictest meaning of the term. 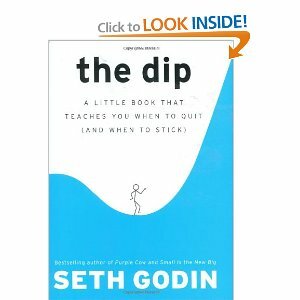 But I really do want to thank Seth Godin on my blog. He’s fantastic and after reading The Dip and consequently plunging and doing what I needed to do to be joyful – I was overwhelmed by the gift he is to people like me. I started reading Seth’s stuff last year and it’s incredible the impact his work has had on my journey to living my dream. In a world where so many seem to take take take – and then take some more – it is SO refreshing to meet someone who gives so cheerfully. In turn it’s difficult to not follow suit. Even if you never buy his books – you can find a ton of free stuff online that I dare say will impact your life – that’s how generous he is. And yet I buy as much of his stuff as I can get my hands on because everything I have of his so far is utterly worth it. Every now and then I think it worthwhile to take a moment and thank those who have, and continue, helping us along as we journey. I’m sending you Much Love and wish you and all you love so dearly health and all the wonderful things that make life worthwhile. Thank you for the gifts. You truly are a blessing. P.S. I ordered The Dip from Kalahari. I’ve found their service is usually the fastest in SA when getting literature that might not always be readily available in book stores. Everyone has them – all the time. But what separates the perpetual “dreamers” from the successful is doing. So what if you fail? At least you’re doing it. So what if you don’t get what you want right now? At least you’re doing it. So what if you don’t know exactly how to do it? Only by doing will you learn. It’s only when you get going that you will meet people who will help you get to where you want to go. It’s hardly ever worth it waiting for “perfect” conditions to do. Perfect never happens. YOU make perfect happen by deciding that right now, today, this very moment, you will begin. Those who are successful now weren’t always that way. They fell many many times too. But they kept doing. And in the doing they learned. And in the learning they grew stronger. And in their strength they built awesome. And in their building awesome we now admire. There isn’t a better person to do what you so desperately want to do. For crying out loud stop wasting time and do. We’re waiting. The young professional market is a highly lucrative one. Get in on the action with B&M entertainment which has strong influence in this market. B&M project managers specialise in event management, Lifestyle Entertainment and Young Adult Development. Their mission is to encourage young adults to be accountable and responsible, while engaging in meaningful future-orientated networking. B&M entertainment are Hannah Viviers Business Training’s marketing partner of choice. We recommend these guys. B&M will be attending our Triple V Breakfast. You might just want to get a hold of Christelle du Toit Communications. They offer high-level communications strategies to companies and individuals seeking meaningful media coverage (both electronic and traditional) and various other forms of publicity. Their consulting services also include Media relations management and Communications training. Christelle is co-author of How to get quoted in the media, an e-book, aimed at SMMEs and NGOs. Auto Specnics cc, accredited members of the RMI (Retail Motor Industry), previously Auto Extreme is an automotive workshop specialising in Renaults. Our main business is servicing, maintenance and repairs. We boast our own in-house Renault Expert who has over 14 years experience in the Automotive industry. He is a qualified Renault Co-Tech (Master Technician). All our technicians are highly experienced in the Renault product. Our workshop is geared with Specialised Renault Tools and Hi-Tech Diagnostic Equipment. At Auto Specnics cc our handy-work is guaranteed and we use Genuine Renault Service Parts and Quality Engine Oil. We are now also proudly accredited members of the RMI (Retail Motor Industry) Group, which allows us to work on vehicles under extended warrantee. Our workshop is conveniently located at 741 Voortrekkers Road (now Steve Biko Road) in the heart of Pretoria’s Motoring Belt. Our main Clients are Private Individuals and Used-Car Dealers. We have not needed to do much in the way of advertising as most of our business comes from word-of-mouth. Address: 741 Voortrekkers Road (now Steve Biko Road), Wonderboom South, Pretoria, 0184.